An artificial disc replacement is a device which is implanted into the spine to imitate the functions of a normal disc. There are many artificial disc designs and it is classified into two types: total disc replacement and disc nucleus replacement. With a total disc replacement, all or most of the disc tissue is removed and a replacement device is implanted into a space between the vertebrae. With a disc replacement, only the center of the disc is removed and replaced with an implant and the outer part of the disc is not removed. Usually the artificial discs are made of metal or plastic like materials or a combination of the two. Some devices have a soft, compressible plastic-like piece between these plates and these devices allow the motion by smooth, curved surfaces that slide across each other. The cervical disc degeneration is a common cause of neck pain that is most frequently felt as a stiff neck. The cervical degenerative disc disease is less common than the disc degeneration in the lumbar spine since the neck is subjected to far less torque and force. A fall or a twisting injury to the disc space can spur the degeneration and accumulated wear and tear on the disc over time and this can also lead to the neck pain caused by the disc degeneration. The general treatment for the cervical degenerative disc disease is largely the same for the degenerative disc disease in the lumbar spine. The conservative care is recommended as the primary strategy and the surgery is considered if a concerted effort at a conservative care fails to provide adequate pain relief or a patient’s daily activity has been significantly compromised. Conservative Care: Patients may get relief from applying ice or heart, exercising the neck and shoulder areas to relieve stiffness and maintain flexibility and using medications to control pain and inflammation. Additionally, neck appliances or traction may be prescribed. Exercises: Stretching as many dimensions on the neck as possible is essential to maintain the flexibility in the neck and relieve the chronic stiffness. A specific set of exercises developed by a physician or a physical therapist can be done several times a day. Over the counter and prescription medications: These include non-steroidal anti-inflammatories (NSAIDs) and pain relievers such as muscle relaxants or the narcotic pain medications. Physical Therapy or chiropractic adjustment: It may provide relief by helping the patients to extend the neck and shoulders to increase the disc space temporarily in the affected vertebral segment. Using a cervical collar, cervical pillows or neck traction: It will be recommended to stabilize the neck and improve the neck alignment so that the disc compression is not exacerbated as the patient sleeps or relaxes at home. If the pain is not relieved adequately within months of conservative care and it is interfering your daily activities then the surgery is considered. Fusion may be recommended to stop the motion of the affected cervical vertebral segment. 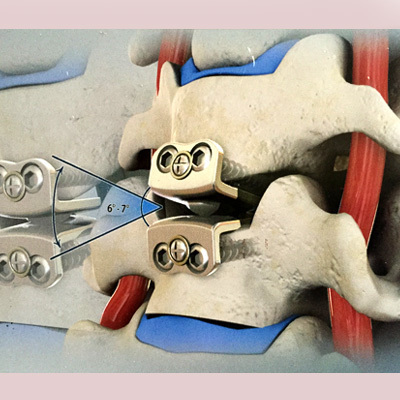 It entails the removal of the disc, decompression of the nerve root and insertion of a bone graft or a metal cage device to help maintain or reestablish the normal height of the disc space as well the neck stability and alignment. A cervical plate may be used to promote the fusion between the two vertebrae. Generally, a one-level fusion is done and in very rare circumstances a two-level fusion is considered. The surgery for neck pain is much less reliable than the surgery to relieve the arm pain from the cervical degenerative disc disease. Hence, if the predominant symptom is neck pain, then fusion surgery should be recommended as the last resort. Artificial intervertabral disc arthroplasty (AIDA) is an alternative for patients with symptomatic cervical DDD. In AIDA, an artificial disc devise is secured in the prepared inter-vertebral space than in the bones. The surgical procedure is similar to the anterior fusion. Artificial disc replacement for the degenerative disc disease of cervical spine is offered at affordable price at Dheeraj Bojwani Consultants in India. Book your free consultation for low cost artificial disc replacement with the best surgeons and the top hospitals in India.